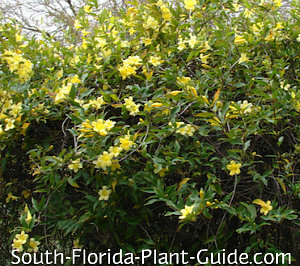 Carolina jasmine is the ideal Florida snowbird vine for its winter and spring color and well-behaved growth habit. A unique sweet-scented climber with manners, this jasmine provides that highly desired cool-weather color but without the crazed growth of a vine like bougainvillea. Butter-yellow blossoms with a light fragrance begin to appear in January and last through spring. This is one vine that, though it's a fast grower, will not run rampant. In fact, it's is so easygoing you can even grow it in a container as long as you provide support with a trellis or lattice on a wall behind it. The new growth will twine around a trellis or fence but it's surprisingly tame and easily controlled. Foliage is made up of narrow green leaves that stay fairly full and bushy - especially in a sunny spot - though not around the base of the vine (common with many vines). 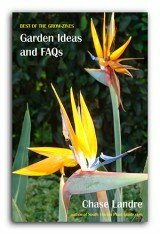 To fill in the blanks you can actually plant groundcovers or low-growing perennials fairly close. 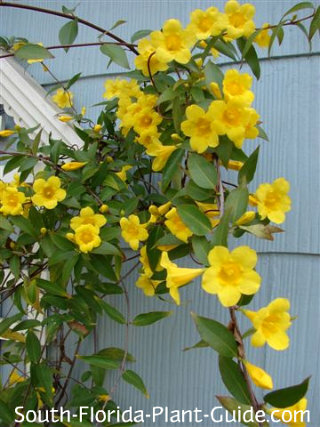 Carolina jasmine contains toxins and the sap can cause skin irritations in some people. Wear gloves when pruning. Native to Florida - and other states - it's the State Flower of South Carolina, hence the common name. This plant is said to be deer-resistant, though we make no guarantees. This vine is a fast grower that prefers full to part sun but will also grow in partial shade (though it won't flower as much). A cold hardy plant, Carolina jasmine does fine anywhere in Florida and throughout the South. To grow several along a fence, place them 3 feet apart. Plant 3 feet from nearest shrub. 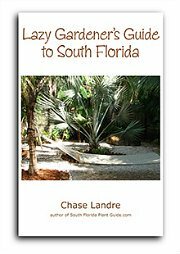 If you grow a low growing plant or groundcover beneath the vine, come out at least 2 feet for planting. Add top soil or organic peat moss mixed with composted cow manure to the hole when you plant. This vine doesn't generally need a hard pruning for size, but if you want to do one, cut it back hard in late spring after the flowering season is over. Fertilize once or twice a year - in late spring or early summer and in fall - with a top quality granular fertilizer. 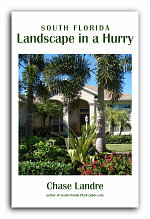 Don't overdo the fertilizing with this plant or you'll get lots of leaves and no flowers.